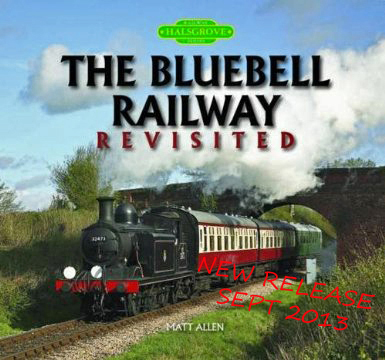 "Railway Series - The Bluebell Railway Revisited"
In 2008, Matt Allen produced an exceptional portrait of the magnificent Bluebell Railway in rural Sussex. In this new volume he makes a return visit to see the line’s many exciting developments, especially the huge achievement of the completion of the “Northern Extension” project taking the railway back to East Grinstead and reconnecting the Bluebell Railway back to the National Rail network. The Bluebell Railway was originally a part of the former Lewes to East Grinstead line and when closure by British Railways loomed, a keen band of volunteers worked hard to prevent the line being consigned to history. In 1960 when the Bluebell Railway was formed, railway preservation was a new concept, making the band of volunteers pioneers of their time. Here premier railway photographer Matt, one of the most active in the UK, takes a photographic journey along the 11 mile Bluebell Railway, showing all the railway has to offer and – of course – the new extension to East Grinstead. In more than 140 evocative images he captures the essence of this magnificent jewel in the British heritage crown. Available from all good bookshops and the usual online book retailers. ISBN 978 0 85704 209 5, hardback, 230x214mm, 144 pages. Published August 2013.